Resident troublemaker Phos finally gets her assigned job from her sensei Kongou, but things aren’t all she hoped they would be when her job requires recording the history of her people. Eager to find herself, she branches out and looks for inspiration from the various other gems she lives with. After confronting the cursed Cinnabar on patrol for information one evening, Phos takes it upon herself to try to find a job that would be more fitting for the lonely night watch gem. 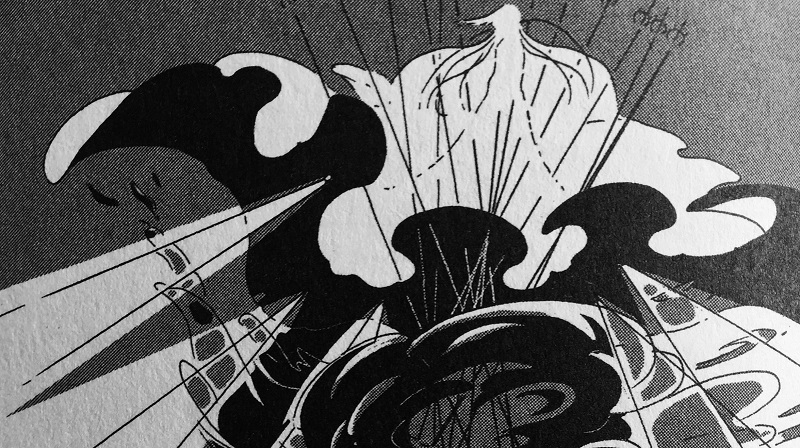 The first volumes of fantasy manga can be difficult to get right- there has to be a certain amount of world-building to keep the reader interested, but the story cannot show too much of its hand early. Land of the Lustrous gets things started in the introductory volume with this in mind. Leading into the first conflict, the main character Phos recites the origin of her people, the Lustrous. Compared to how other fantasy manga attempt to use a lack of world-building to feign mystery or drama, it is a refreshing change of pace to see a series play it straight right off the bat. Unfortunately, much of the story outside of this is lacking. The plot basically consists of Phos being given a job to record the natural history of her people as her chosen role in society. This isn’t an issue on its own, but this entire plotline is abandoned fairly quickly after being emphasised as important. After yearning for a way to find a purpose for the night watch gem Cinnabar, the bulk of the volume is spent with her pestering other members of the Lustrous for nondescript ideas on how to help. The story begins to drag noticeably from this point on, with slow conversations that lead nowhere and a dizzying amount of characters being introduced that fail to add any interest into the plot. There is a double-edged sword for the work as well in its uniquely abstract style. The various Lustrous members are all based off actual stones, and their appearances, body strengths and weaknesses are reflective of this. As clever as this sounds, it is difficult to get the full effect of the narrative as the book constantly and aggressively reminds readers of how vibrant the colors of the individuals are as well as their unique properties. In a lot of instances with multiple people in a frame, it was rather difficult to tell who was who since they were all drawn with the same bold lighting effect. When less is going on and there is only one or two characters standing next to each other, the tiny details in differences of lighting work really well. Although the effect can cause confusion in the book, it is commendable to see such a risk taken. The major benefit to the abstract art style can easily be found in the combat, as the enemies from outer space are all designed in ways that only get more bizarre and unsettling as fights go on. In one instance, what begins as clouds of fluffy fairy creatures splits in half with humanoid archers launching arrows out of holes that form a beehive pattern. In another, a character is vomiting poison that adds bold contrast to the frames being drawn. I hate to make comparisons to other works, but the best things to compare to it visually are the various battles with witches in the series Madoka Magica. Some characters like Phos’ person of interest Cinnabar have prices to pay for using their abilities, and the visuals are notably graphic. Technically speaking, there are no real stakes since the gems shatter after losing fights and can just be reassembled, but this isn’t done without its own gut-wrenching fashion. It is a nice sight to see a work go for it with its own style and ambitions at a pace uniquely fitting for itself. However, it does come with a cost. Land of the Lustrous is an absolute visual treat; it glows with abstract sequences and some of the more unique character designs seen this year in manga. But for all of the risks it takes, it still leaves a mess of a story behind that cannot even be saved by the effective world-building it has early on. Whenever Land of the Lustrous is not hitting all of the marks with its abstract art style, the results are noticeably difficult to get through. This shouldn’t be a deterrent, however, for continuing the series- there is a lot to work with from here and it leaves me eager to continue reading and seeing the full potential of such abstract and unique ideas. 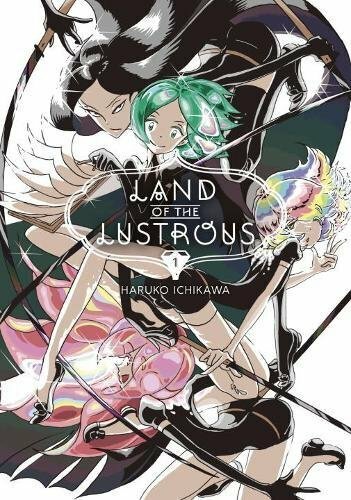 Land of the Lustrous is published in English by Kodansha Comics USA. The series is written by Haruko Ichikawa and published in Japanese under Kodansha's Monthly Afternoon imprint. An anime series produced by the studio Orange is scheduled to begin airing October 7th.